Tip: Make the remedy more effective by adding a teaspoon of lemon juice to it. Packed with vitamin C, this is the best remedy to lighten blemishes and acne scars. Apply freshly squeezed lemon juice on the acne and age spots. Leave it on the pimples for a quarter of an hour before washing the face clean. You can also buy expensive Vitamin C serums to lighten the skin and reduce acne scarring but this inexpensive remedy works great too! Tip: Make the remedy even more potent by adding honey to it. Honey is antibacterial and reduces new blemishes. Another wonderful remedy, potato juice can lighten the skin quickly to help you regain your natural glowing complexion. This remedy is especially recommended for reducing acne marks on oily skin. You can use it for dry skin as well but it will end up drying your skin further. So, make sure you moisturize after with a non-comedogenic moisturizer. Simply grate a potato and apply its juice all over the acne marks and pimple scars. Let it air dry. Wash off after the skin starts feeling tighter. Tip: People with dry skin must drink plenty of water to hydrate the skin from the inside when using any acne-scar lightening treatment. Like potato juice, cucumber juice also contains skin lightening properties. Apply it to the acne scars to whiten and lighten them and also to get rid of dark circles and age spots. Leave the juice on the acne scars for at least 15 minutes. Repeat this remedy two-three times a week to see results. Tip: Add a teaspoon of powdered oats and some honey to cucumber juice. Use this face mask on the acne prone skin to lighten, heal, soothe, protect the skin and eliminate pimple marks permanently. Tomato juice is another skin bleaching home remedy that can be used to lighten acne scars quickly. Cut open a tomato and rub the slice on the skin. It might sting a bit, so avoid using it on active acne. Leave it on for 10 minutes before rinsing the skin clean. Tip: Mix tomato and cucumber juice for a power packed acne-scar-minimizing face mask. Pineapple contains many healing compounds and enzymes which can lighten the skin and fade acne marks when used regularly. Squeeze fresh pineapple juice and apply all over the face or simply spot-treat the acne scars. Wash off after 15-20 minutes. Repeat the remedy at least 2-3 times a week to see results. Honey is antibacterial, antimicrobial and antiseptic. Apply raw honey to acne blemishes regularly to lighten the skin and also prevent new breakouts. Tip: Apply honey and lemon juice to the acne marks as stated above to quickly reduce acne marks overnight. Turmeric is packed with antibacterial and anti-inflammatory compounds that can lighten skin tone and also heal active acne. Apply turmeric paste (made with milk or water) on the skin. Leave it on for 15 minutes. Wash off with a mild soap. Tip: Include turmeric in your soups, stews and curries to fight inflammation inside the body. You can also make a turmeric face mask with sandalwood powder and milk to reduce acne scarring. Dry some orange peels in the sun. Once completely dried, pulse them in a mixer to powder them. Make a paste of this powder in little water or milk and apply it on the face. This remedy will help you get rid of pimple marks overnight. Tip: Simply rubbing the inner fleshy part of orange peel on the acne blemishes also works wonders! Rosehip seed essential oil is one of the best oils for fading pimple scars. It contains bio-available form of vitamin C and vitamin A derivative tretinoin which is known to fade pimple marks and blemishes to lighten them overnight. Tip: Other essential oils to fade pimple marks and acne scars include oils of vetiver, rosewood, St.John’s Wort, calendula, tea tree, lemon balm oil, frankincense, yarrow, myrrh, geranium and helichrysum. If these above home remedies for acne scars and dark spots on cheeks do not show result, you might want to consider laser therapy. Laser and other skin rejuvenation treatments have come a long way and most of them have minimum down time with quick, guaranteed results. 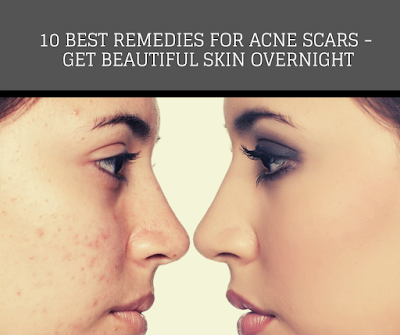 Try these home remedies and homemade acne scar removal creams first before seeking professional help.